Tails are wagging at the mention of Family Day, which is coming up on Monday, Feb. 20. Family Day isn’t just for your two-legged family members though. Fluffy and Fido would also love to spend time with you. Whether you’re snuggling up in front of the TV, heading out for a walk, or spending the day away visiting family, Family Day is the perfect opportunity to spend some quality time with your two and four-legged family members. Looking for ideas on what you can do to keep busy and have a fun day this Family Day? We’ve got a few ideas that you and your pets are sure to love! National Cupcake Day™ for SPCAs and Humane Societies is Feb. 27. If you haven't yet registered to host a Cupcake Day Party, there's still time to get involved and bake a difference in the lives of animals in need. We want your Cupcake Day experience to be a sweet one for you and your guests, which is why we asked celebrity chef Anna Olson to share a mouth-watering cupcake recipe that is sure to win over even the toughest critics. Visit our blog to see Anna Olson’s Chocolate Peppermint Cupcake recipe. Have friends with dogs? Another fun alternative or addition to a Cupcake Day Party is a Pupcake Party. Your event will go to the dogs – literally – when you offer Fido and his friends a canine-friendly cupcake. To help inspire you, we wanted to share this great “pupcake” recipe from Anna Olson. Definitely worth a try! Now in its fifth year, National Cupcake Day is presented in partnership by the Ontario SPCA and BC SPCA and is a collaborative event to support local SPCAs and humane societies across the country. To participate, visit nationalcupcakeday.ca to register to host a National Cupcake Day party and invite co-workers, friends and family. Guests donate to the participating animal welfare charity of the host’s choice in exchange for a cupcake, raising critically-needed funds for animals that are abused, abandoned, neglected or no longer wanted. To help us find loving homes for our little friends, PetSmart® hosted a rat adopt-a-thon, sponsored by PetSmart Charities®, at a number of stores across the province from Jan. 21 to Feb. 12. We’re thrilled to report that over 350 of these pocket-sized pets were adopted! That’s a lot of happy rats in loving new homes! Looking for a smart, low-maintenance pet? 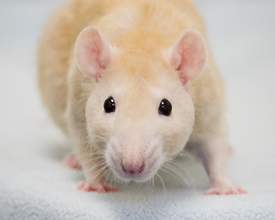 Consider adopting a rat! Visit our blog to learn more about why rats make great pets, as well as tips on caring for your pet rat. Winter is far from over and there are still many cold days ahead. 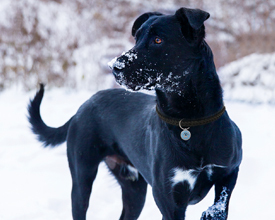 If your pet enjoys being outside and thrives on fresh air and exercise, they could be at risk of hypothermia. Would you recognize the signs if your pet was suffering from hypothermia and would you know what to do? Prevention is half the battle when it comes to keeping your pets warm and safe. For some pets, their fur coats can protect them to a certain extent outside, but only when there’s no breeze. If the breeze is enough to lift the fur, their vulnerable skin is exposed to the cold. This is why it’s critical to listen to weather reports to hear not only the temperature, but also the wind chill values. If your pet is outside, they need to have ready and accessible access to a proper shelter so they can get out of the wind when they need to. Visit our blog for more prevention tips and to learn more about the signs of hypothermia and how treat it. We’re going to be introducing some new Ontario SPCA merchandise and we want you to help us determine what makes the cut. We want to know what you’d be most interested in purchasing from a new online store available through our website. Our goal is to offer Ontario SPCA-branded merchandise that animal lovers like you need and want. 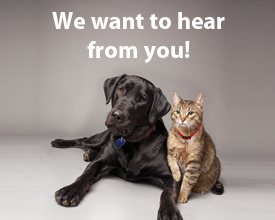 Please take a minute of your time to answer our poll question to tell us about the type of products that you value as a pet owner. Thank you for sharing your valuable opinion with us. 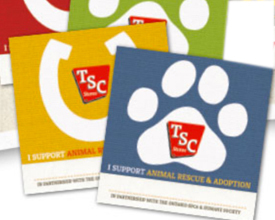 Drop by your local TSC Store (The Incredible Country Hardware Store) starting on Feb. 24 to participate in the Paws & Hooves Program supporting the Ontario SPCA and our Affiliate Communities. For every $2 donation, you’ll receive a paper paw or hoof of your choosing to be displayed in the store showing your support. More than $228,000 has been raised to date through the Paws & Hooves program to help animals in your community and across Ontario. Please visit your local TSC Store to participate in the Paws & Hooves program and help make a difference in the lives of animals in need.